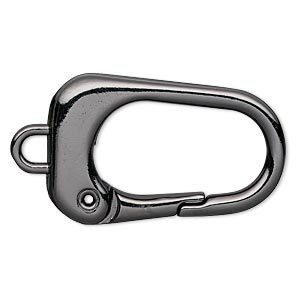 Key ring, gunmetal-finished steel, 35mm 3/4 circle with 9.5mm ball ends and loop. Sold per pkg of 4. Item Number: H20-A6901FN Have a question about this item? With an attractive gunmetal finish, these 3/4 circle steel key rings are tipped with a pair of 9.5mm balls: one ball that screws off and on to accept and secure keys, the other featuring a 1.5mm diameter loop. These rings are easy-selling, multipurpose items that any customer can use as is or embellished with your own creative designs. Key ring, gold-finished steel and brass, 35mm 3/4 circle with 9.5mm round and loop. Sold per pkg of 4. 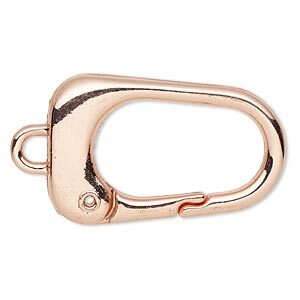 Key ring, copper-finished steel, 35mm 3/4 circle with 9.5mm ball ends and loop. Sold per pkg of 4. 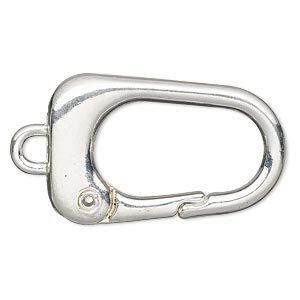 Key ring, silver-finished steel and brass, 35mm 3/4 circle with 9.5mm round and loop. Sold per pkg of 4. Key ring, gunmetal-finished "pewter" (zinc-based alloy), 38x24mm trapezoid. Sold per pkg of 2. Key ring, silver-finished steel and "pewter" (zinc-based alloy), 38x24mm trapezoid. Sold per pkg of 2. Key ring, gold-finished "pewter" (zinc-based alloy), 38x24mm trapezoid. Sold per pkg of 2. Key ring, copper-finished "pewter" (zinc-based alloy), 38x24mm trapezoid. Sold per pkg of 2.